These robust and visually attractive litter collection receptacles have been found to encourage litter separation and deposition by passing pedestrians. The domed top and access hatch are stainless steel for strength, appearance and ease of cleaning. Side panels and doors are powder coated steel mounting feet are height adjustable for uneven surfaces. 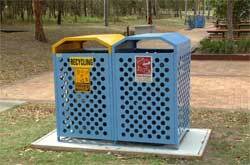 Mobile garbage bin liners can be 120, 140 or 240 litre capacity. The entry hatch is large enough to take large pizza boxes/food trays etc. Bolt down cleats are fitted internally to secure the frame to the paved surface.